Forces loyal to President Bashar al-Assad captured the southern Damascus suburb of Hujaira on Wednesday, part of a broader advance that has brought him major gains south of the capital before proposed international peace talks. Assad's military resurgence this year has relied to a great extent on support from Shi'ite Iran and fighters from Lebanon's Hezbollah and Iraqi militias, some of them based around a Shi'ite shrine southeast of Damascus. They have helped turn the tide against the Sunni Muslim rebels, whose ranks are increasingly dominated by Islamist fighters and al Qaeda-linked foreign jihadists. Earlier in the week, a rebel groups’ joint declaration said government forces backed by Hezbollah fighters, Iranian Revolutionary Guards and the Iraqi Abu al-Fadl Abbas militia had launched “a fierce offensive to reoccupy” Aleppo. Additionally, ISIS in Aleppo released a statement confirming that it had suffered many casualties during clashes with Syrian forces near the 80th brigade army base, Tal'aran town and al-Sfeira city. The Syrian conflict may be entering a new stage, where Saudi support for Takfiri fighters comes up short against the resolve of Syrian and Shia fighting forces, and IRGC support/expertise. Mark- these Rats can't win,won't win,TRUTH IS not on their side and the whole thing will crumble down when Allepo falls!.The world must listen to Iran! when it says the West can not win in Syria!. Recent gains by Assad are due to new tactics, like attacking terrorist concentrations outside urban places and cutting their supply lines. Also, liberated areas are secured by the newly created "militias", comprised of local inhibitants , who know their surroundings. Recently the Syrian Army overtaken two highrise buildings in Allepo, in an area controlled for months by the terrorists. the Assad forces advance but they can not hold for any length of time. 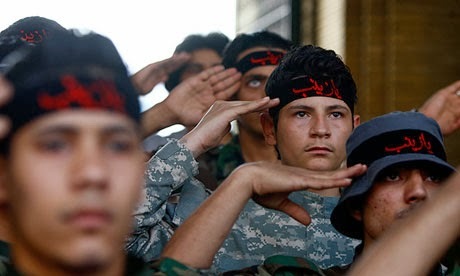 http://www.liveleak.com/view?i=95d_1384462798 --- Iranians fighting for Bashar Al-Assad. At present, the West's main victory would be an assasination of Assad and its top commanders. I wouldn't doubt that they are working on that goal, notwithstanding that Assad is necessary for them, for a while, to complete the "chemical weapons' deal". Not long time ago, important senior Syrian intelligence officer, Gen. Jamu-Jamu, was killed (apparently by a sniper) in Deir Ezzor town. In Libya, they also assasinated top rebels, who were too independent, and had previous Afghanistan fighting's backgrounds with the Soviet Army. Russia will not fight for the Assads under any circumstance and will make a deal to help oust the dictatorship if it's in Russian interests. https://www.youtube.com/watch?v=roEETnc70eU --- Iraq a history of colonialism.